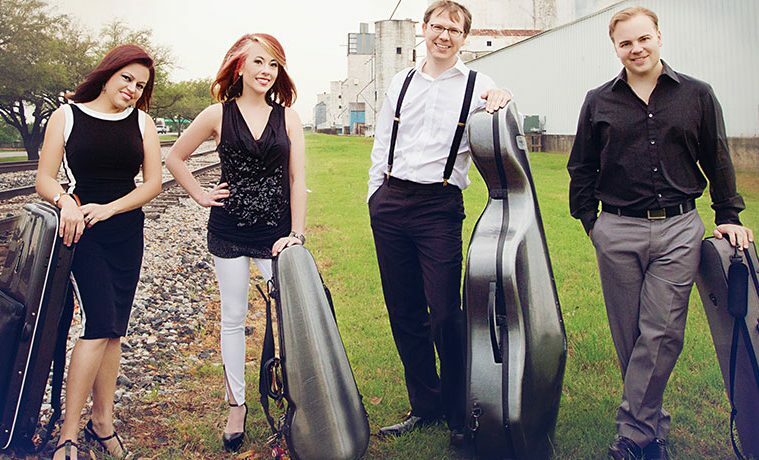 IMAGE ABOVE: Apollo Chamber Players. Photo by Cris Stephens. 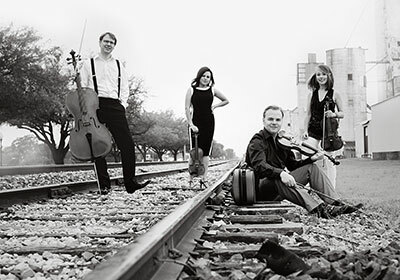 Houston’s Apollo Chamber Players swoop into their sixth season with Ancestral Voices, a four part program series incorporating their mission to explore the rich intersection of western classical and folk music, that incorporates new works commission project 20×2020. Fresh from their Carnegie Hall debut performance in New York, Apollo’s first album released this year, European Folkscapes, defines their niche of showcasing traditional folk melodies in dynamic new contexts. 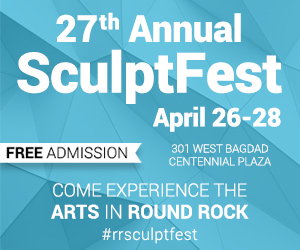 Apollo will tour this season’s program through Houston, Louisiana, and Arkansas. Their opening concert, Bohemian Inception, American Inspiration, features a world premiere of a piece by award winning American composer, Libby Larsen, held at Duncan Recital Hall, Rice University, Sept. 21. Grammy Award winner Larsen is one of the most performed living American composers. 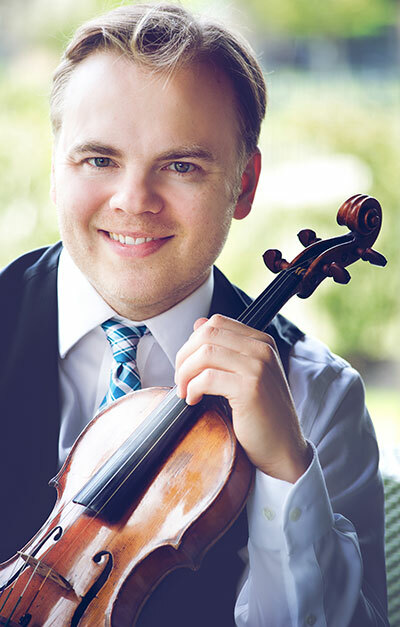 Apollo’s artistic director and violinist, Matthew Detrick, sat down with Arts + Culture music writer Shannon Langman to set the scene for the new season. A+C: This is quite the season for you by expanding your tour to reach farther across the US, the addition of a prominent composer collaboration and the 20×2020 project. How did Libby Larsen get involved? Matt Detrick: After the success (and fun) of commissioning our first piece, Fantasy on Bulgarian Rhythms by Rice University composer Karim Al-Zand last season, we knew wanted to continue commissioning new works with the same idea in mind; that is, providing a context for composers to write specifically for Apollo and our mission. Given Ms. Larsen’s pedigree and acclaim, we were unsure if she would be interested in our request…much to our excitement, however, she responded with genuine enthusiasm. I think she was particularly drawn to the programming of the concert and for the opportunity to explore this fascinating connection between Dvorak and Burleigh. I must also add that Ms. Larsen’s commissioning wait-list is a couple of years in advance; she was so kind to have taken on our project with relatively short notice. We are grateful she will be attending the concert as well! A+C: This season brings an interesting fusion of folk and new composition, drawing on old traditions while exploring the connections between ethnic and classical music. What inspired this season’s programming? MD: Apollo’s inspiration is always to explore the rich (and sometimes hidden) connections between classical and folkloric music. This season’s focus on the Ancestral Voices behind these inspirations takes our mission a step further, highlighting folk-based classical works and original arrangements that connect seemingly disparate composers and cultures. Just as important in our focus has been the planning of a multi-year commissioning project, 20×2020. With the aim of commissioning 20 new folk-inspired works by the end of the decade, 20×2020 sees its launching at our opening concert, Bohemian Inception, American Inspiration. 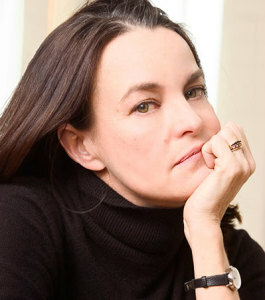 We are very fortunate to have commissioned a new work from Grammy-winning composer Libby Larsen. The piece for string quartet is titled Sorrow Song and Jubilee, and was composed as an homage to the creative partnership of Dvorak and Henry Thacker Burleigh, an African-American composer who shared folksongs with his mentor Dvorak. Our second season concert sees the world premiere of a Japanese folk-inspired string quartet work by Marty Regen, and our final concert features the premiere of a new work by the winner of our 2014 international commissioning contest. This season sees THREE world premieres, in fact. A+C: How does Larsen’s work mix with the rest of the evening’s rep? Specific to your question, the music of Sorrow Song and Jubilee is based on the “sorrow song” (now known as spiritual) “Swing Low Sweet Chariot”, but it is composed in a Bohemian style colored with the unmistakable flavors of Dvorak. The integration of these two styles is masterful and, I think, illustrative of America’s unique diversity of ideas. A+C: The theme and tone of this season and opening concert are very specific. Would you say it is representative of your niche as a group? MD: Very much so, on both accounts – I think they exemplify Apollo’s mission in a real, tangible way. While the focus for each concert is rather specific, they all stem from the hidden connections and shared inspiration between composers and their relationship to folkloric music. More importantly, this inspiration is timeless! Part of the crux of 20×2020 is to illustrate that (classical) composition is still very much relevant and alive, that composers draw ideas from contemporary society as well as from the voices of ancestors. A+C: Apollo recently made its Carnegie Hall debut. Has this changed anything for the group or the group dynamic? MD: The whole experience was fun and completely energizing! I think it has given the group a fresh confidence, not only in our playing, but also with what Apollo has to offer through its mission and programming. It was humbling to have attracted such a diverse, eclectic crowd for our Carnegie concert, as it is in hometown Houston; one of the things of which we are most proud is bringing new faces into the concert hall. The debut also has helped with goal-setting and getting us to ‘think big’. I’m not sure we would have had the confidence, or even the imagination, to embark on a project of such scale like 20×2020 if it had not been for our debut, and the release of our first album. A+C: Another new fusion, you and Apollo violinist Anabel got married this year. Congratulations! MD: Thank you! Yes, this fusion has been a few years in the making, but it was special to make things official. It is much fun performing with the person you care about most…it adds a new dimension to our mutual love of music, I think. It’s definitely easier to ‘read’ what the other person might want to do with a musical phase or idea. On the other hand, there are some obvious traps that musician couples can find themselves in..our philosophy is to separate the personal and business as much as possible. But in the end, it’s a very rewarding, meaningful experience. Shannon Langman is a Houston based photographer, singer, writer and educator.